UPDATE: A list of the 133 NYC schools in which the Tripod survey is being given this spring is here. One school apparently dropped out. The UFT and the DOE are still in negotiations about whether this $5M survey will be used next year, or another one will be chosen to replace it. In the meantime, check to see if your school is on the list, and if so, make sure you as a parent has been notified by your principal and received an opt out form. Last year when the UFT and the DOE could not come to an agreement about their teacher evaluation system, Commissioner King stepped in and mandated that the Tripod Survey would have to be part of the evaluation system. The Tripod is a student survey that the Gates Foundation used in its Measures of Effective Teacher studies. With the apparent consent of the DOE, King determined that the survey would be given to students in grades 3-12, and the responses would count for 5 percent of a teacher's rating. Apparently because of UFT resistance, King said the survey would only be piloted for the first year, and then given to all students the second year. After this announcement was made, Valerie Strauss wrote in the Washington Post: "There are several questionable elements to the new teacher evaluation system just imposed on New York City schools by state education Commissioner John King, but the one that jumps out for sheer nitwittedness is this: Students starting in third grade will now have a say in the official assessment of their teachers." In February, I volunteered to serve on a committee formed by the Chancellor's Parent Advisory Council to work with DOE officials on how this survey would be administered. We had our first meeting March 20. During the meeting, DOE officials from their Research division promised that no personal student information would be provided via the survey, and that in fact, no personally identifiable information would be included anywhere on the survey sheet or the envelope containing each survey, provided to the company for its calculations. I asked if parents would be allowed to see the survey in advance, and opt their kids out. The DOE officials were reluctant to agree to this until I pointed out that according to Joel Reidenberg, privacy expert at Fordham, the federal law called the Protection of Pupil Rights Amendment (PPRA) requires this. We also pressed them to make the survey available to parents online, but they subsequently decided to make it only available at the school site, so a parent has to actually go to the school to check the survey in advance. Finally, when they said that the survey would be voluntary on the part of schools as well, we urged them to allow the School Leadership Team to make the decision as to whether to administer it. On March 31, we met again with DOE officials as well as Ron Ferguson and the team from Cambridge Education LLC. They took us through a power point and explained that the survey questions are built around the "7 C's": Care, Control, Clarify, Challenge, Captivate, Confer, and Consolidate. They explained that the survey was originally designed for teacher feedback and NOT teacher evaluation, and that a different version is used in grades 3-5 and in grades 6-12. Many of the questions relate to a student's emotional state, like "Being in the class makes me angry" or "I get nervous in this class" or "My behavior is a problem for the teacher in this class" or "I feel out of place in this class, like I don't really fit in." 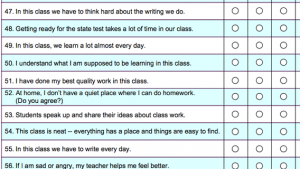 Other questions relate to classroom control and how able students are to have their questions answered; these seem to me as though the responses would likely be affected by conditions outside a teacher's control, such as class size. Ferguson admitted that class size was somewhat correlated with the responses that students provide. The survey also includes a Part II, with questions relating to the student's economic and family background, including what ethnic group they belong to, how many adults they live with at home, whether they own a computer, and how many books are in their bedroom. There are several sample versions of the Tripod survey online, though the DOE told us that they were using a new version, so the ones assigned to NYC schools will not match up exactly. First, see Appendix A of this Advocates for Children report, with sample Tripod survey questions for the Elementary (grades 3-5) and Secondary students (Grades 6-12.) See also this version for Secondary students that was on the Rochester Teachers website, though DOE says they will not be using part III, which includes some very personal questions. We were led to believe that there would be another meeting of the CPAC committee before the survey was given, but repeated emails got no response, until a parent sent a message that she had heard the survey administration had already begun in her district. Then the DOE admitted that they had already begun giving the survey on May 3 and this would run through June 26. In the 134 schools in which it is being piloted, according to the DOE, "school leaders and UFT Chapter leaders agreed to participate and were encouraged to collaborate with their School Leadership Teams on their administration plan." Anyway, be sure to ask if your school is participating in this survey, remember that as a parent, you have the right to see it in advance, and can opt your child out if you prefer.